Booth after booth was filled with all sorts of goodies, from toys to DVDs and games to weaponry. Almost anything was there and could be ours for the low price of a few limbs. I peeked at some artbooks, but didn't really see anything I couldn't live without. I was rather tempted to buy Nikki a cute Lain-style bear hat from Genki Hats, but we were slightly deterred by the price. So we circled around until I had a good idea of all the vendors, at which point we were mostly chatting with Nick and occasionally throwing an eye over the vendor tables. That's when I found the game vendor. I saw several old Playstation games there, but was quickly put off by the prices. A copy of Silhouette Mirage was marked at $49.99. A ridiculous sum considering you can get it for $20 or less online. I was almost tempted by a copy of Rez for the Dreamcast, but once again the price made rethink that idea. 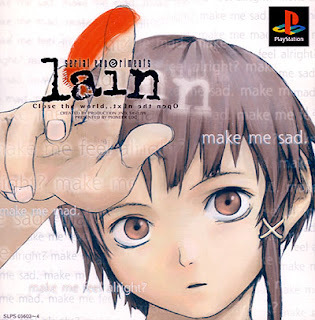 Though still curious, I asked the vendor if they had by chance a copy of Lain for Playstation, a rare Japanese game. "Oh yeah," said the man excitedly and pulled it out for me to look at. For a split second there I was debating the possibility. Could it be that there was any chance at all that this game may at last come into my possession? Nope. I almost let out a ridiculing laugh when I saw the price sticker of $173. Sure it's rare, and collectable, and an import. But there's no way I'd pay that much for it. No way. And judging from their other price hikes, I would guess that even now the game was attainable for under $100, assuming you can find it, online. In other words, the dealer's room offers a chance for some rare and cool goodies, but you better be prepared to drop a small fortune on most things you buy there. As for me, I'll continue to shop online for most of my anime and manga related needs. If you want to get a fair deal I suggest you do the same. As the staff announced the closing of the dealer's room, I already felt satisfied with having seen it. And that only lasted about fifteen minutes, so I'm not sure if that's good or bad. Given the chance, I probably would have spent a little more time in there, but I still doubt I would have bought anything. In the last few minutes we had been joined by another friend, Ming, and we all made our way to the exit.